Professional projects took many forms for the families in our towns. 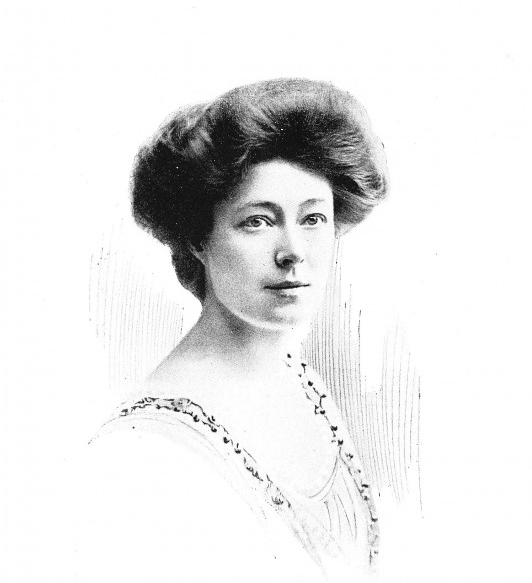 Celebrated soprano, Miss Emily Breare (1883-1967) represented just such a project. A grand-daughter of our Leeds professional cohort, Emily lived an exciting professional life and fulfilled the ambitions of her own father’s professional project. Trained from an early age by her father, newspaper man William Hammond Breare (1858-1935) , she became well-respected and toured the county, even singing in the Proms at the Queens Hall in September 1907, conducted by Henry Wood. Professionally, however, William appears in the Victorian Professions Project‘s database as the husband of Ellen Ackrill* (1851-1932) and rather than a vocal artist he made his career as a literary journalist (1881 Census) and then editor (1891 Census) of his father-in-law’s newspaper, the Harrogate Herald – a paper he would edit for over 50 years. William’s probate of £3353 17s 8d suggests this brought him a comfortable existence and plenty of means to support his daughter in her own professional vocal career. His sons would follow him into the newspaper instead. William also seems to have continued his interest in professional music by means of the pen, authoring Vocalism from an English Standpoint (1904), Elocution. Its First Principals (1905) and Vocal Faults and their Remedies (1907). He also coached his daughter using his extensive music collection, until she was noticed by gifted choir trainer Dr. Henry Coward and her professional career took off. The latter engaged her as his principal soprano for a tour of Canada with the Sheffield Choir in 1908. The 200 strong choir performed at the Montreal Arena to an audience of 4000. The Montreal Gazette declared the event a huge success and choral singing at its best. After a somewhat wobbly start (probably due to nerves), Emily redeemed herself and was specifically praised for her soprano solo of ‘I Know that my Redeemer Liveth‘ and ‘Elizabeth’s Prayer‘. Returning triumphant, the celebrated Sir Frederick Bridge recommended her for Callirhoe with the Reading Philharmonic Society shortly afterwards. ‘Flexibility’, ‘power’ and ‘ease’ were all words used to describe Emily’s delivery in the press and the Reading Observer remarked: “Of Miss Breare it is impossible to speak too highly”. Success clearly lead to a life on the road. In 1908 she received high praise for a voice that was “clear as a crystal” in the Tonypandy Harmonic Society Christmas Oratorios (Rhondda, Wales). The next summer Emily was back in Wales again, making her first appearance in the esteemed pier concerts in Llandudno for the first time, alongside Madame Ada Crossley, an Australian singer. 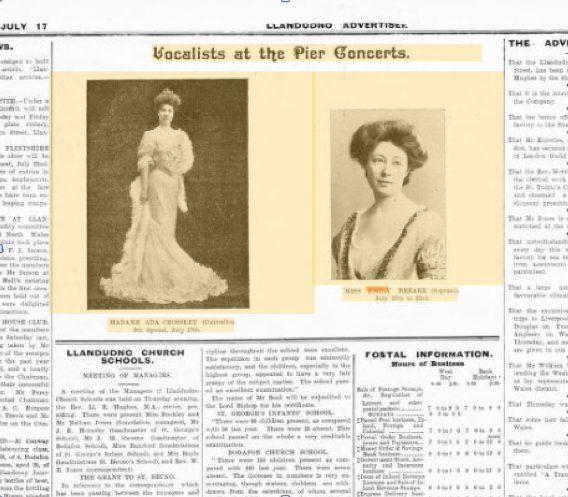 Their photos dominated the page in the Llandudno Advertiser, which informed its readers that Emily had the highest credentials, having been one of the Carl Rosa’s Opera Company and that she was also engaged later in the season with the Moody Manners, another touring opera company. Both companies were principal training grounds for British artist before World War One. Back on the road again for a more unusual event in December 1910, Emily performed the Messiah with the Western District Choral Society to 100 prisoners at Wormwood Scrubbs Prison. The prisoners were asked not to applaud and to treat the performance as part of their regular chapel service. Apparently more than once their feelings got the better of them and there was some humming and stamping of feet. When Emily performed ‘Come unto Me‘, the press reported that “many a hand was furtively raised to wipe away a tear…hardened perhaps as they were, [they] could not resist the wonderful power and charm of the singer’s voice”. 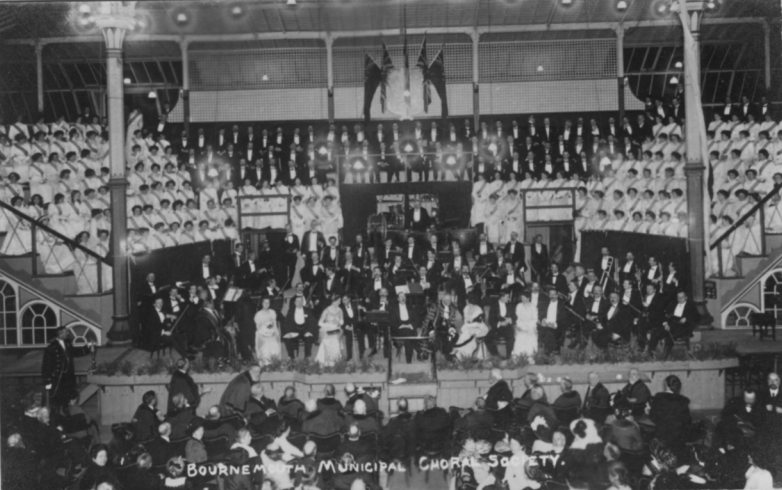 The following December we find her in Bournemouth performing the Messiah with British bass singer Robert Radford and the new Bournemouth Municipal Choir (see image), a very grand civic event and quite the opposite of her trip to prison. Did Yorkshire remain ‘home’ for Emily despite her professional travels? It is difficult to tell. In the census of 1911 she was boarding in St. Giles and Bloomsbury at the Montague Hotel but this may have been linked to a specific engagement and she seems to have been in demand far and wide. She gives her occupation in that census as ‘Principal Soprano’ and specifically names the Peterhead Choral Society (near Aberdeen). Certainly the next year she is actually in Scotland performing at The Kinnaird Hall, Dundee in the role of Margeurite in the Damnation of Faust, accompanied by the Scottish Orchestra. Wherever she regarded home to be, it is clear that Emily had a long career as a professional singer and was still performing in her forties. There is a record of her performing as a soloist in Birmingham with the Birmingham Choral Union in 1922, conducted by Richard Wasssell, and a few years later in a Yorkshire Evening News concert arranged and directed by Cecil Moon in 1925. I could not find any evidence of Emily having married or having had children alongside her career but it does seem plausible that she returned to Harrogate to live with her wider family there. Certainly buried there in 1967, having lived to age 86, she shares a commemoration stone in Harlow Hill Cemetery, Harrogate with her brother Robert Ackrill Breare (1878-1955), who had been a newspaper man like their father. There is no mention of her successful career as the soprano with “a voice like crystal”. * Ellen’s father, Robert Ackrill (1816-1894), is one of our Leeds cohort for 1851. 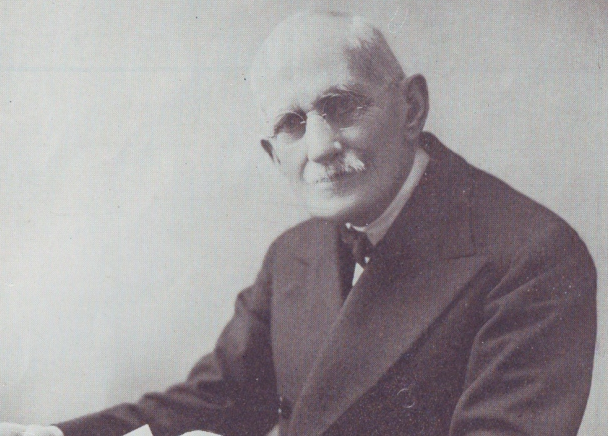 A former printer, he first became the editor of the Harrogate Herald before later becoming its owner. In the 1870s he also purchased the rival paper, the Harrogate Advertiser. The Breare’s eventually took ownership and a family newspaper dynasty was born, lasting until the 1980s.